Mercure Hotel Bad Duerkheim An Den Salinen. Book now! Set in a peaceful location at the edge of the spa gardens, the 4-star Mercure Hotel Bad Dürkheim an den Salinen invites you to take a relaxing break. 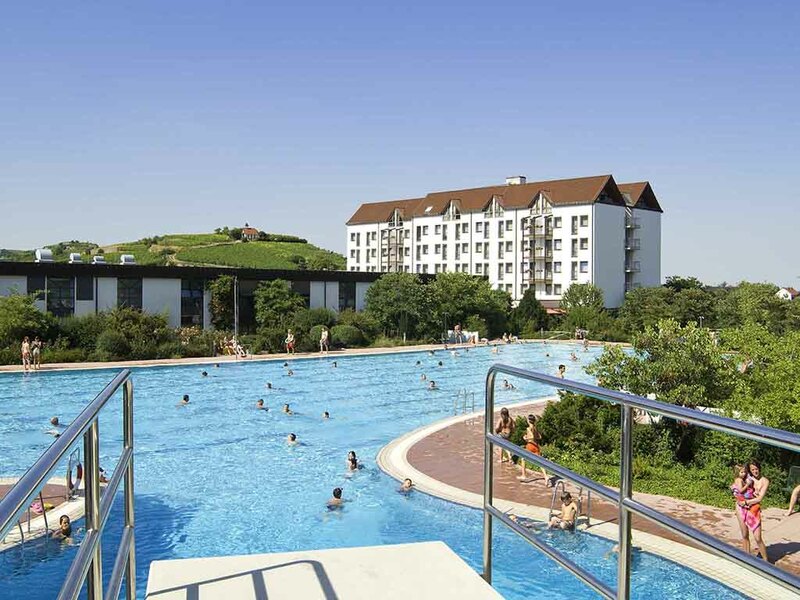 Enjoy the comfort our 100 rooms with WIFI and visit the "Salinarium" water park (closed in September) fre e of charge. Our events highlight is the large 10,764 sq. ft (1000 sq. m) multifunctional hall. Our hotel boasts a total of 14 meeting rooms. There is no free parking available in September due to the Wurstmarkt wine festival. The Bad Dürkheim wine region in the south of Rhineland-Pfalz is part of the Rhine-Neckar metropolitan region, together with Mannheim, Ludwigshafen, Heidelberg and others, making it part of one of the key business locations in Germany. At the 4-star Mercure Hotel Bad Dürkheim an den Salinen, you can choose between Standard Rooms with single or twin beds and Superior Rooms with twin beds and a balcony. Privilege Rooms are furnished with a double bed. We have specially adapted rooms available for guests with reduced mobility. All 100 rooms have WIFI. One child aged up to 12 can sleep in your room free of charge. Your pet is also welcome (for a charge of EUR 6 per night). Our modern "Salinenrestaurant" seats up to 120 guests. We serve an extensive breakfast in the morning and regularly offer our guests delicious themed buffets for lunch and dinner. We serve our guests both regional and international cuisine in our à la carte restaurant. Soak up the special atmosphere of the "Kelterstube," and when the sun is shining, why not enjoy your meal out on our terrace? All 60 seats in our park restaurant enjoy a fantastic view of the sun terrace and the saline (graduation tower). Ideal for family and corporate events. The "Cafe-Bar" will entice you with its modern decoration, as well as with its fantastic view over the spa gardens of Bad Dürkheim. Excellent wines from the Pfalz region, specialty coffees and appetizing snacks are served every day from 10am until 1am. Arrived late after trying to call to confirm room wood be held - but no English spoken which was a surprise. But on arrival was surprised at such a stylish hotel. Initial impressions were very good. Then I was given a room that on first impressions was a bit dated but not bad. I had booked a privilege room & had my suspicions that this not as described - but a few comments on TA suggested it might be difficult to judge as the difference between room types was small. So I went to reception to check but was reassured that I had been given the correct grade room. Overnight after reading the room description again I became sure it was the wrong type of room & sure enough when I enquired again I was quite quickly given a different room which was better. Fortunately I had not unpacked so it was easy enough to change rooms - but just a little surprised & disappointed that they could not sort out the room types at the first time of asking. So just be aware and ask as the difference in appearance between the rooms is small. Once that was sorted out I really liked the hotel. Good bar & restaurant. Easy parking. All in all not bad & good value for money. This is an excellent hotel. Friendly staff, especially during breakfast, always helpfull and every request is fulfilled. The only downside would be the updating of the rooms (new carpets) and installing airco for the summer months. Otherwise great hotel, great location and added benefits (access to Swimming pool, etc...). I firmly recommend this hotel when visiting the Reinland Pfalz region. We stayed here for a few nights in Sept 2018 whilst visiting friends in the area. The hotel is very clean and well situated for Bad Durkheim Bahnhof (a short walk) and Gradierwerk (huge salt/brushwood evaporation structure - amazing) . The spa gardens are very pleasant also. The hotel has access to the pool and facilities of the Bad Durkheim Spa, but if this is important to you, avoid September as these facilities are closed most of the month on account of the Bad Durkheim WurstMarkt. i am retired and travel a lot for leisure. This the first hotel I have come across where every sinner person was pleasant, friendly and helpful. From the receptionist to the waiters/waitresses and the cleaning staff. We were on business in the area and needed a place to stay for a single night only. Booking was quick and accurate and the rate was most adequate. The facilities at the hotel were excellent, as was breakfast the next morning. The hotel is located in a beautiful touristic area, which means there is a lot to see and there are many shops and restaurants to explore in the small town centre. Easy check-in, great location, clean room, easy check-out. . . what more could we want? Thanks! Although it was quite bussy due to the Wurstmarkt event the atmosphere as well the Service is very professionell. Calm, customer oriented and dedicated to be present when needed. I love to stay in this beatufil Hotel.! It was a pleasure to stay here, superb rooms, good food and friendly helpful staff in a great location. Wished we had longer to stay as the facilities, pool especially, looked really inviting. It`s is not my first time staying in this hotel, therefore I always appreciate the atmosphere of welcome and dedicated service. I will be back soon. Very pleasant, room was comfortable, staff was very helpful and friendly. All though the internet connection was really slow, maybe could get a faster internet connection option for the guests. I had a comfortable stay. Staff were friendly and helpful. Nice hotel, very friendly Staff, fanstastic Breakfast. only one bad consideration: kitchen is not on top of other services or facilities It could be surely better.